The Boston Bruins enter the 2018-19 season in an enviable position in many respects, however, the biggest question in mid-September is the same as it was in late June. Who will step into the role as the third line centre? With the exhibition season underway, the Bruins fans have gravitated toward three options: Jakob Forsbacka Karlsson, Trent Frederic and Jack Studnicka. All three have a legitimate chance and will use training camp and the exhibition season to try to seize the job formerly held by the Columbus Blue Jackets’ Swiss Army knife, Riley Nash. All will try and make their mark on what should be a talented, deep and young forward group. Lovingly known as “JFK”, Jakob Forsbacka Karlsson turned pro following his 2016-17 season with Boston University and like many Bruins before him, served his hockey apprenticeship in Providence for the 2017-18 season putting up 15 goals and 17 assists in 58 games as a rookie, adding another assist in four playoff games. Forsbacka Karlsson may be the best and safest option for third-line centre, with his high hockey IQ and advanced defensive game. 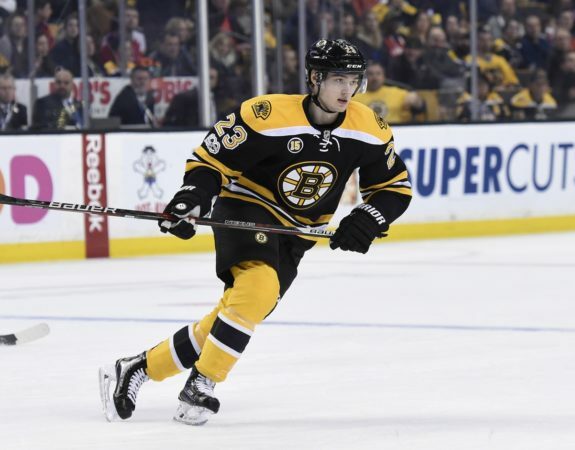 A trio with David Backes on his right and either Danton Heinen, Ryan Donato or Anders Bjork on his left would also allow Forsbacka Karlsson the ability to create from the middle. It would also give the Bruins the balanced three-line attack that worked so well when Patrice Bergeron, David Krejci and Nash were healthy during the 2017-18 campaign. In the end, it might as simple as choosing Forsbacka Karlsson because he is the most familiar with the pro game. He played in one game with the big Bruins in 2016-17 before his AHL time a year ago, whereas his competition will be coming from the NCAA and OHL, carrying only 18 professional games (all with Providence) between them. A first-round selection, Trent Frederic had a lot of negative attention from fans when he was drafted 29th overall in 2016 ahead of names like Sam Steel, Jordan Kyrou & Alex DeBrincat. Tempers were only flared when then Bruins director of amateur scouting Keith Gretzky said that Trent Frederic “is not going to be a top-two-line guy, we know that”. While it appears that Frederic won’t be a “top-two-line” guy in the immediate, he certainly has the opportunity to be a high level third line player. 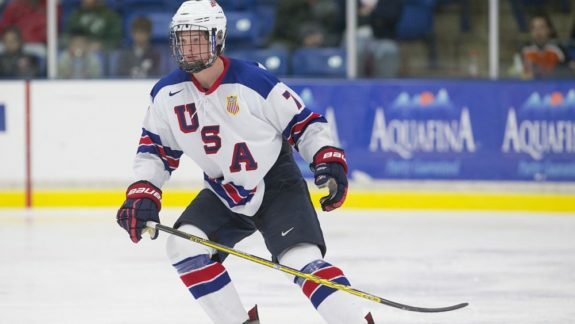 Following his draft season where he wasn’t a dynamic force with the USNTDP, Frederic enrolled at the University of Wisconsin where his first round talent shone through. As a freshman, Frederic scored 15 goals added 18 assists for 33 points in 30 games, good for second on the Badgers and followed that up with a 17-15-32 line in 36 games as a sophomore again good for second on the team. Frederic also suited up for Team USA at the World Junior Championships seeing 7 games in the tournament, scoring 5 goals on his way to a bronze medal. It was following his NCAA season however where he may have at his most impressive, signing with the Bruins and forgoing his final two years of eligibility at Wisconsin on March 13, 2018, Frederic would go on to rack up 5 goals and 3 assists for 8 points in 13 games for the Providence Bruins and turning many of his most ardent doubters into believers in his potential as a pro. Should he win the third line centre job for the Bruins, Frederic would likely team up David Backes, whom he’s drawn many comparisons to creating a rather sizeable third line that could create havoc in the offensive zone no matter who plays to their left. Frederic certainly has the skill to be an NHL regular this season and has the size to handle himself when games get physical but the Bruins will have to decide whether bringing him almost straight from college to the NHL or a full year in the AHL will serve him best moving forward. The youngest, but perhaps most intriguing member of this group is Jack Studnicka, drafted in the second round, 53rd overall in the 2017 NHL draft, he has drawn comparisons from junior hockey announcers and analysts (myself included) to future Hall of Fame Bruins centre Patrice Bergeron. 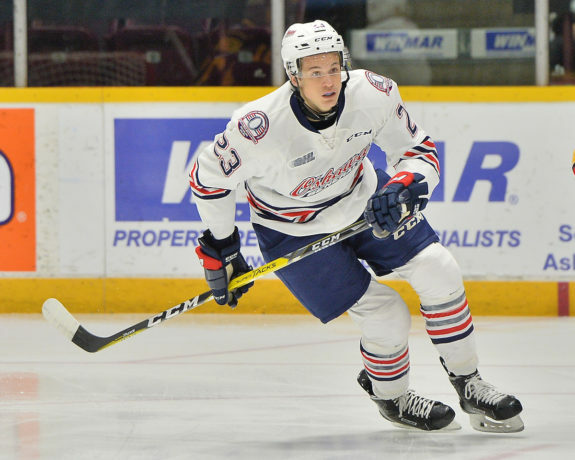 Possessing next level hockey IQ, Studnicka is able to excel in all aspects of the game and has been a dominant player for the OHL’s Oshawa Generals. In his draft season, Studnicka posted an 18-34-52 line in 64 games but made his real impact in the playoffs with 5 goals and 10 assists for 15 points in 11 contests, Studnicka followed that up by posting 22 goals and 50 assists for 72 points in the 17-18 season with another point per game postseason (1 goal/4 assists in 5 games) on a young Generals squad that struggled to find consistency outside of their captain. The comparison to Bergeron comes from the little elements of Studnicka’s game that can at times go under the radar, his positioning as a centre is consistently outstanding, enabling him to break up plays simply by being in the right spot on the ice. In the offensive zone, Studnicka can be a nightmare for opposing defensemen. Ale to use a strong base and quick hands to hold off defenders in possession and find teammates in open patches of ice with accuracy. Special teams is also a place Studnicka excels, both on the penalty kill, with his skills in the faceoff circle and strong positioning and on the power play his ability to run a power-play from the half wall has been very impressive at the junior level. Studnicka joined Providence for 5 games at the end of his OHL year and recorded a goal and 4 assists in 5 games, again just upping his stock among prospect watchers. The toolbox is impressive but will a 19-year-old centre be able to make the jump right from the OHL to a Bruins team expected to compete for an Atlantic Division title? The Bruins will certainly test his physical ability to handle the pro game in camp and the pre-season, which may make the biggest impact on Studnicka’s potential to take an NHL role this season. Jakob Forsbacka-Karlsson appears that he has the inside track on the role, with his year in Providence providing him a chance to adjust to the professional level and his 3 zone skill set making him an easy fit. Trent Frederic looks to have a very bright future but a year in Providence would not hurt his development and he will certainly have a chance to see time in Boston should injuries or inefficiencies arise. Jack Studnicka remains the most interesting of the three simply due to age, at 19 (a 1999 birthdate) he will either have to make the Boston Bruins or be sent back to what should be an OHL Championship contender Oshawa Generals. The Bruins can give Studnicka a trial run in NHL games but the question of what’s best for the young centre’s development will certainly be asked over and over again among Bruins staff before the season begins.